Just need that final push, you're practically overachieving with them anyways! Surprising to see Bala so low. At least you're getting your qualifications out of the way. I assume with the new dynamics thing that will help get players and keep them motivated? Also, would you rather be in the promotion group and potentially thrashed every game or in the relegation group and perhaps build morale with some wins? Have been following along and i am glad to see that your fortunes have changed since moving to Wales. Fingers crossed for your badges. And that's a welcome change so it is @DNZY as I've only been used to underachieving with clubs thus far. That's a tough one @Suffolk Seasider. If we finish in the top six then that means Rhyl can't be relegated and thus in return it means I can't (ideally) be sacked as a result but a bottom half finish means we could potentially win more games. As for keeping the players motivated, well, hopefully me getting coaching badges means they players will start "beliveing" in me. Cheers @Ruskii but I don't think I can get used to winning so many games, it's a welcome change. 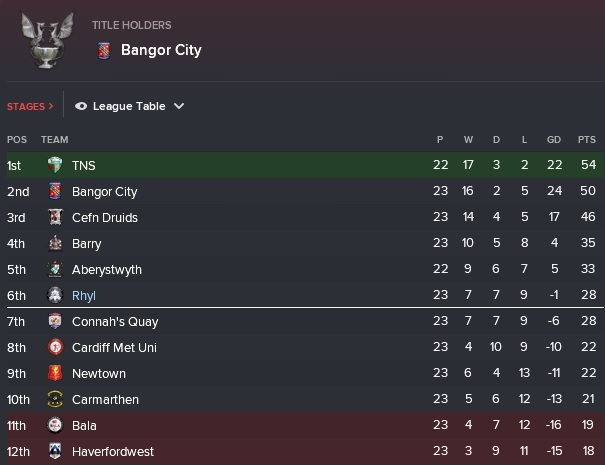 It's been a mixed but enjoyable season thus far at Rhyl as we find ourselves up in seventh place with six wins from our opening nineteen games as we are close to securing an unlikely top six finish which will mean we won't be able to be relegated to the First Division. They'll be four league games this month as we will entertain Bangor City and Carmarthen before travelling to Cardiff Metropolitan University, the fourth game will be the first game in the split. We have secured our second victory of the season against the reigning champions Bangor City as a Jonny James goal, five minutes before half time, sealed the three points at Belle Vue. On a high from securing maximum points against Bangor City, we welcomed Carmarthen to our Belle Vue home and despite getting off to a flyer courtsey of a Jonny James goal on five minutes, Touray equalised for the visitors four minutes into the second half. The final game before the split saw us make the journey to Cyncoed Campus to face Cardiff Met and the points were shared in a six goal thriller but because of Connah's Quay being held to a nil nil draw at Carmarthen it means we've secured a top six finish in the Welsh Premier League. New striker Phillips' goal on eight minutes got us off to a flyer, Branch levelled for the hosts on the hour, Watkin put us back into the lead six minutes later but goals from M. Jones and S. Jones within four minutes put Cardiff Met three two up but Will Bell's spot kick in the ninety third minute secured a top six finish for Rhyl. Our first game in the Championship Conference saw us welcome Cefn Druids to Belle Vue and an excellent second half performance from the visitors ensured a three one win as Orme hit a second half hat trick, Phillips scored a consolation for us with two minutes remaining. With just nine games remaining I'm over the moon that we had secured a top six finish but I'm now just hoping we don't lose all ten games in the Championship Conference (one's already been played vs. Cfen Druids) while the other newly promoted side, Havefordwest continue to prop up the table. Good going getting top six. As you said, just hoping you don't get battered in those fixtures! Always have a soft spot for the Welsh Leagues, in particular Airbus UK Broughton. Haha, love seeing Connah's Quay suffer. I've a feeling we're going to @r96Skinner but at least we can't be relegated now and thus I should be secure. That's correct @Suffolk Seasider and I for one am delighted. It's the first time I've had somewhat success in the Welsh Leagues @HockeyBhoy when I'm not managing The New Saints. 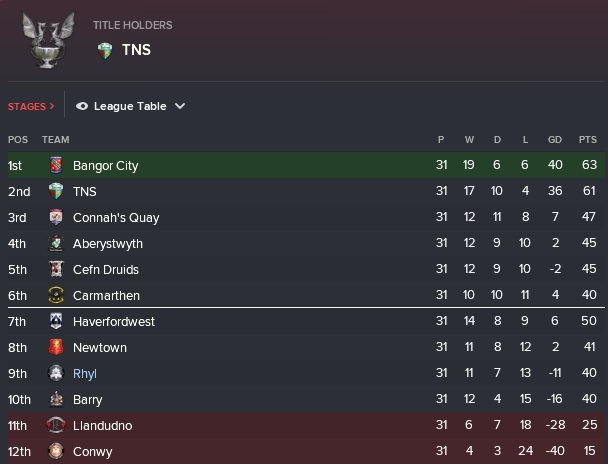 First and foremost I feel like I should apologise for the length it took between this update and the previous one, unfortunately I had been suffering computer issues and it decided to die on me (RIP my computer) but now I'm back with my February update which'll see me play four games in the Championship Conference as we face three consecutive away trips to Bangor City, Aberystwyth and Barry Town United before welcoming league leaders The New Saints to Belle Vue. The month began with a trip to a rainy Nantporth as we suffered a disappointing single goal defeat against Bangor City. Hewitt scored the Citizens' winner on thirty eight minutes while Phillps missed a sitter for Rhyl in the second period to secure a point on our travels. Our second of three consecutive trips saw us make the two hour plus journey to Aberystwyth as a single goal from the penalty spot eighteen minutes from time was the difference maker as Sheridan scored from twelve yards. The third and final away game in a row took us to Jenner Park and a frustrating afternoon saw us suffer a two one defeat courtsey of a ninety four minute Bishop-Wisdom goal which irratated me. Collins' goal had given Barry the lead on sixty six minutes but Michael Pritchard's leveller on eighty three seemingly rescued us a point with our first goal this month but Barry won it in the fourth minute of three added on. When you're three goals to nil down at home to the league leaders inside the opening SEVEN minutes it's always going to be "damage limatation" against The New Saints - we managed to keep it down to four on a poor afternoon at Belle Vue as Lofts bagged a hat trick and Wes Fletcher also found to net on an easy afternoon for the leaders. 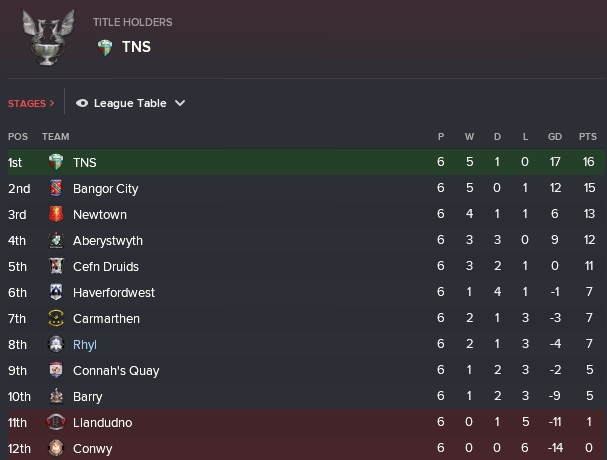 Due to the split we obviously can't slip any further than sixth but seventh placed Connah's Quay are seven points ahead of us (reason one why I hate the split at times). Bala Town are now propping up the table while The New Saints are five clear with five league games remaining. @Shedender for when they sacked me even when I was fourth in the league. Not a great month there, then again they're tough sides. Still might sneak into Europe! 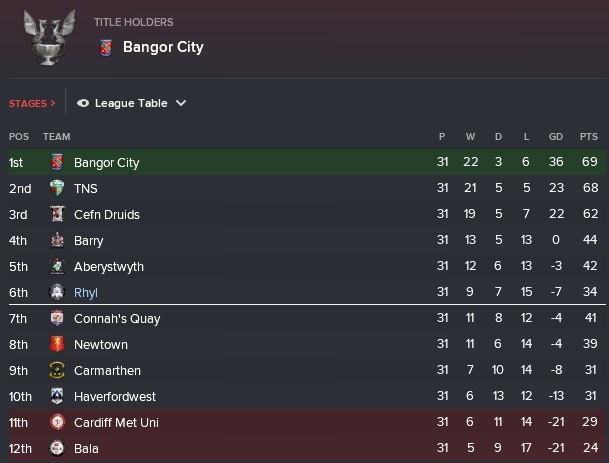 On the back of five consecutive defeats and just two goals scored (vs. Barry Town United and Cfen Druids) there was zero confidence surrounding the football club as we entered the business end of the campaign and just two games were to be played this month as the side travelled to Cefn Druids and welcomed Bangor City to Belle Vue. The month began with a trip to third placed Cefn Druids who inflicted a sixth consecutive defeat in the Championship Conference as the hosts secured a two one victory at The Rock. Orne gave the hosts the lead with four first half minutes remaining, Joe Phillips equalised on fifty seven minutes but the losing streak continued when Blake struck on eighty two minutes. It's now seven straight defeats for my Rhyl side as Holsgrove's goal on nineteen minutes gave Bangor a single goal win at Belle Vue. With just three league games remaining we won't be able finish any higher than sixth place and it's looking like we'll finish with less points than the teams in seventh (Newtown), eighth (Connah's Quay) and ninth (Havefordwest) unless we can pick up points and soon. Barring a miracle, Bala Town look doomed at the foot of the table and it's a three team shoot-out for the title between The New Saints, Bangor City and Cefn Druids. Thats a shocking championship set of results so far! Probably to be expected though @Dan because remember, we were predicted to finish rock bottom of the WPL. 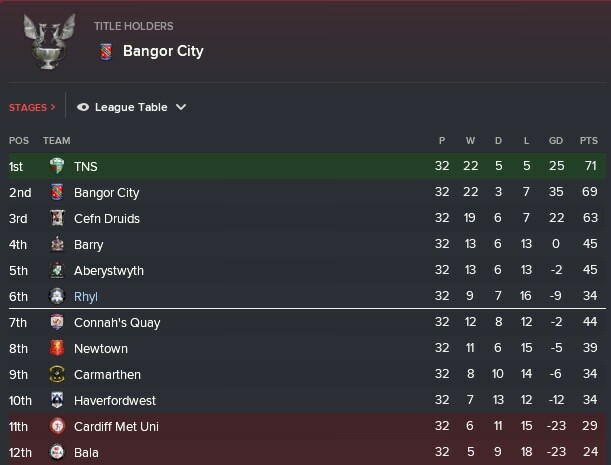 It's now become seven straight Welsh Premier League defeats following last months losses against Cfen Druids and Bangor City and with confidence well and truly gone I can't see a league victory coming for my Rhyl side - the only crumb of comfort is that we had already survived in the league. This month we have two WPL fixtures at our Belle Vue home as we welcome the visit of both Barry Town and Aberystwyth. A VICTORY!! The run of seven consecutive league defeats came to an end this afternoon as we recorded an excellent two one success (to be fair, any victory at this stage is 'excellent' ) against Barry Town and we led two nil at half time thanks to two goals in the space of seven minutes through Michael Prichard and Joe Phillips - McLaggon pulled one back for Barry on seventy one minutes but we held on for the three points. And now it's back to back three points as we defeated Aberystwyth by four goals to two but we left it late to secure the points. Goals from Watkin and Joe Phillips had us two goals up inside the opening quarter of an hour and that's how it remained until two minutes into the second half when Cooke pulled a goal back and then on seventy five minutes Sheppard headed home a corner to level the scores at Belle Vue. With two minutes remaining Michael Pritchard put us back in front, Phillips' second of the afternoon, two minutes later, sealed the points. It's official, we are going to finish on less points than the teams in seventh and eighth position (Connah's Quay and Newtown) but that doesn't bother me too much as we are sixth. Much to my surprise, Bala have been relegated while it's either going to be Cardiff Metropolitan University or Havefordwest who will get the relegation/promotion playoff spot. It's going to be a 'tense' final day shoot-out for the league between Bangor City and The New Saints - The New Saints face ourselves at home while Bangor City travel to Aberystwyth. The final piece of news this month is a big one and that's because I've guided Rhyl to a successful enough season the new board are allowing me to go on a coaching course and this will be for my Continental C Licence which I'm 'thrilled' about. The Football Club will be covering the nine hundred and sixty pounds for the course and it'll be approx. four months worth of study. My first season at Belle Vue is nearly over and it's been a frustrating but enjoyable first season at Rhyl Football Club as we managed to avoid relegation (and the sack) quite comfortably but with fifteen defeats and possibly a sixteenth coming up in our final game, away to The New Saints, that's something I'll need to try and address in the summer but it's always going to be difficult against with a struggling semi-professional club who has a poor reputation - but, we'll plough along. The final game of the Welsh Premier League season took us to The New Saints who ended up being crowned champions following a two nil success and Bangor's defeat to Aberystwyth. Goals in either half from Wes Fletcher and Luke(?) Lofts gave the only professional side in the division not just the points but the title. Qualifying for Europe through the playoff stages was always going to difficult for an inconsistent Lilywhites side so when Aberystwyth secured a five one victory at Park Avenue I was still slightly annoyed, mainly due to the fact we were four nil down after thirty nine minutes as Cummings, Christopher, Hobson and Lucas all scored - Luke Boundford pulled a goal back a minute before half time on his return from injury but it was a mere consolation goal because Baker added a fifth goal with seventy two minutes played. And this is how the league standings for the twenty eighteen twenty nineteen season has ended. 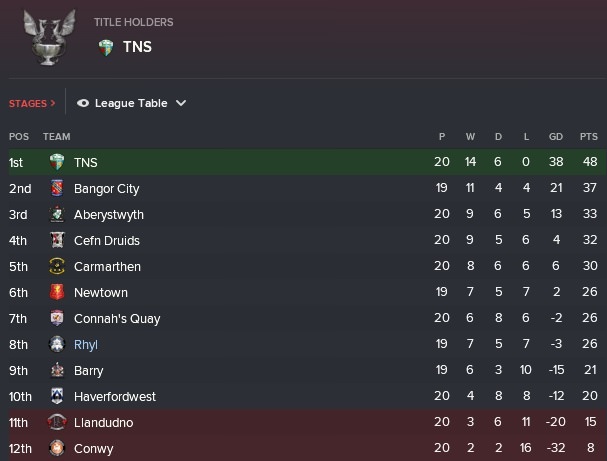 Due to the two nil win over us and Bangor's one nil defeat away to Aberystwyth, The New Saints "stole" the title on the final day and we ended up finishing ten points behind seventh placed Connah's Quay. Bala were already relegated and Cardiff Met Uni must play a two legged playoff against the second best team from the Cymru Alliance. Now whether I remain at Rhyl for a second season remains to be seen, if a suitable job becomes available, I will then apply and see if I'm successful but it needs to be the correct job - the point of this career is I'm supposed to try and win every domestic trophy from all the playable leagues and so far I'm two seasons down and the trophy cabinet has gathered spiders and their cobwebs - I'm just relieved though I got through one season without getting the sack, progress has been somewhat made. It's going to be difficult @Dan fella, especially when this team is mince and will always be predicted to struggle in the WPL. For the first time in my short managerial career I actually completed a season without getting the sack so that's impressive in it's own right. I unfortunately head into my second full season in charge of Rhyl full and well known that it's going to be another season of struggle at Belle Vue and I'd do quite well to secure another top six finish. In the summer I had applied for the vacancy at Bangor City after their manager didn't renew his contract but due to managing the "scum" I was immediately not shortlisted for an interview. I felt I needed to have a busy summer of recruitment ahead but when you're managing a poor semi-professional side who are always predicted to struggle, signings are difficult enough to come by. Nine ended up joining though and all on free transfers - James Joyce, Owain Llyr Jones, Tom Dix, Scott Gooding (loan), Ryan Connolly and Tom Pugh all joined from Port Talbot, Llandudno, Flint Town, The New Saints, Havefordwest County and Afan Lido respectively while Danny Shaw, Michael Pearson and John Gordon were all unattached to clubs. James Davies was the only departure, joining newly promoted Conwy on-loan. It was ALMOST a perfect program in preseason but a last game one nil defeat to Kinmel Bay ruined it. Don't let the results in preseason fool you because in the seven games arranged they were all against Amateur opposition and all away from our Belle Vue ground. Things began with a three one success against Llandudno Junction before beating Glan Conwy two nil just four days later, four days on a three one success at St Asaph before recording back-to-back two nil victories against Greenfield and Rhuddlan - Llansannan were then defeated four one before the preseason concluded with that solitary defeat. 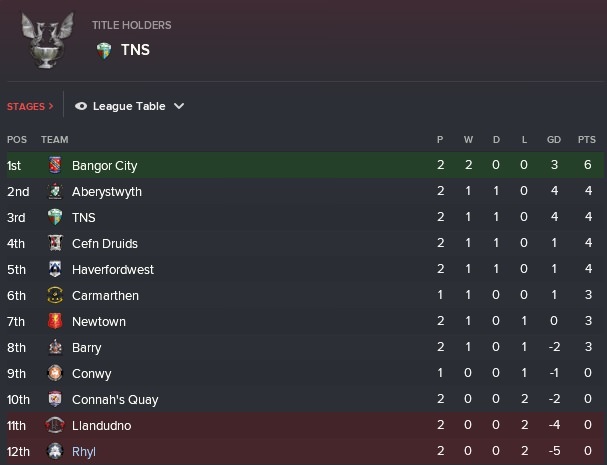 With preseason done and dusted it is now time to begin my season full season in charge of Rhyl and I'm hoping it'll be my last season with the Belle Vue outfit as the entire point of this career is to travel the world and win every trophy possible - thus far, no trophies have entered the cabinet and it hasn't looked close to gaining one. August has seen me play three competitive matches as we hosted Connah's Quay in theWord Cup first round before the league campaign begins as Carmarthen visits our Belle Vue home and then our second league game will see us make the journey to Aberystwyth Town. Our run in theWord Cup has ended at the first hurdle this season following this one nil defeat at home to Connah's Quay as Shackleton struck the only goal on twenty four minutes at Belle Vue. Following a first round theWord Cup exit, the league campaign also kicked off with a single goal to nil defeat at home to Carmarthen as Ellis Bellamy's goal (I wanted to sign him in the summer!) on sixty six minutes gave Carmarthen all three points. We have failed to score a single league goal throughout the month of August for the second season running after Aberystwyth ran a mock at Park Avenue, winning four nil. There was four different goal scorers for the hosts as Williams, Frater, Lucas and Billing all found the onion back. It's early days but we find ourselves bottom of the table on goal difference after the opening two games with newly promoted duo Llandudno, Conwy and Connah's Quay also pointless at the end of August. Bangor City, who lost the league on the final day last season are the only team with a one hundred percent record after two games. It's always going to be a struggle with this lot @HockeyBhoy and as for Airbus, well, they didn't get promoted unfortunately. Once again it's been a tough start to the season for Rhyl Football Club as we have yet again failed to find the net in a league match in August for the second season running while we also crashed out of theWord Cup at the first hurdle, losing one nil to Connah's Quay at home. And now as we find ourselves in September there's four league games to be played with three of them being away from home - we will face the newly promoted duo Conwy and Llandudno, Havefordwest County and the champions The New Saints who'll be our one and only home game this month. We picked up our first victory of the season at Y Morfa Stadium as Conwy Borough were defeated five one but we left it late to finish off the hosts as all the goals arrived in the final twenty two minutes. Centre back Will Bell and attacking midfielder Michael Pritchard both hit braces while Luke Boundford also found the net, Newell bagged a consolation goal for the hosts on seventy four minutes but they were well beaten in the end. And now it was our turn to suffer a humiliating home defeat as The New Saints ran a mock at Belle Vue, winning five nil and even having a man sent off. Wes Fletcher struck twice inside the opening quarter to put TNS in firm control, Lofts added a third before Routledge was dismissed five minutes into the second half - further goals from Holland and Hill sealed the emphatic win for the champions. The side bounced back though in the next game as two goals inside the opening half an hour from Luke Boundford and Watkin sealed a comfortable two nil win at Llandudno. Yawnfest. 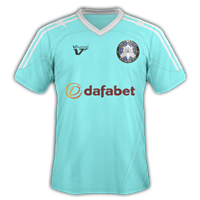 The month ended with a trip to Havefordwest, it finished nil nil and the game wasn't very good but it was back-to-back clean sheets for The Lilywhites and two games unbeaten. After another slow start to the league campaign, we have began to climb the league table and now we find ourselves up in eighth position following our two victories this month on the road against Conwy and Llandudno. Conwy have had a rough welcome to the Welsh Premier League, losing all opening six games while the reigning champions TNS lead the league and a point clear of Bangor. 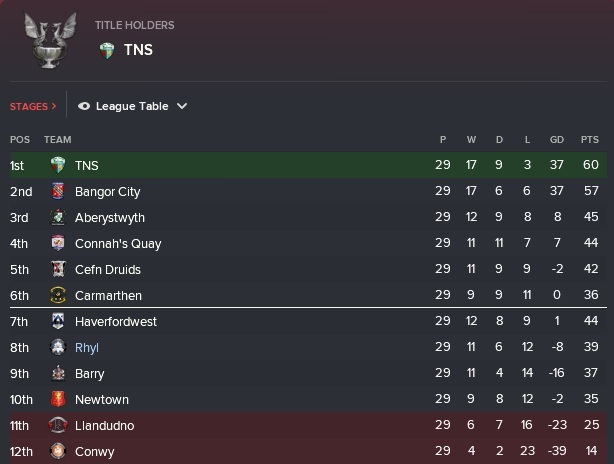 Last month we actually won two league games, granted they were both against the newly promoted duo of Conwy and Llandudno but at least they're wins nonetheless in the Welsh Premier League. We have four more league fixtures coming up in October with two being at home against Connah's Quay and Barry Town United while the two away games will take us to Newtown and Cefn Druids. Can we maintain our decent start to the campaign or will October turn out to be a disastrous month? It would be a home defeat that kicked off the month as Connah's Quay recorded a two one success at Belle Vue. Francis gave Quay the lead on twenty five minutes before Hazell's goal, two minutes from time, proved to be the winner because John Gordon pulled one back with the game entering stoppage time but the visitors held on for maximum points. A late show at Latham Park saw Newtown and Rhyl share the points in a one all draw - Newtown looked set to win the game when Smith put the home side into the lead on eighty three minutes but just four minutes later Declan Poole smashed home an equaliser as the game finished level. We won our first game of the month, recording a hard fought three two victory over Barry Town United at Belle Vue. Luke Boundford broke the deadlock on sixteen minutes but the away side levelled through James' goal on the half hour, two goals in ten second half minutes from Tom Dix and Boundford's second had us three one up but James' second of the afternoon made it a tense finish but we held on for three vital and huge points. The month ended with a trip to our bogey side Cefn Druids, a side who had beaten us in all four games last season but we proved we're not to be messed with as Rhyl recorded an excellent two one victory despite finishing the game with ten men. Michael Pritchard put us into the lead on seventy two minutes from the penalty spot but a minute later Tom Dix was sent off, Luke Boundford then made it two nil with seven minutes remaining but we couldn't keep a rare clean sheet because Reynolds bagged a consolation goal for the hosts in the fourth minute of added time. Those two victories has seen us climb the league table up one position to seventh as we are three games unbeaten in the Welsh Premier League. Conwy continue to be win-less and pointless, six points behind fellow promoted side Llandudno while The New Saints are now four points clear of Bangor City at the summit. I think it's time I begin to fire out the updates instead of one every day which it's been like the last few days, minus the fact there's been no update the past three days due to me being busy. Anyway we have reached the penulimate month of the calendar year (November for those who don't know) and we have six matches awaiting us - we will face Carmarthen, Aberystwyth, Conwy, The New Saints and Llandudno in the league while we'll be facing lover league side Goytre United in the third round of the Welsh Cup at Belle Vue. A trip to Camarthen began the month, the game ended nil nil. Yawn. Three days later we welcomed Aberystwyth to Belle Vue and a thirteen minute collapse in the second half saw the visitors head home with a three nil victory. Lucas gave Aberystwyth the lead two minutes into the second half, Hughes-Jones doubled the proceedings on fifty four and then six minutes later Bollard added the third for the away side. Poor but I take the entire blame for the defeat. Our run in this season's Welsh Cup ended at the first hurdle (similar to theWord Cup as well) as lower league side Goytre United secured a penalty shootout victory at Belle Vue following a one all draw but Rhyl should've won this with ease as the side dominated. Will Bell gave us the expected lead on twenty one minutes but James levelled for the away side eight minutes later. Two goals in the first half saw us return to winning ways, securing a two nil victory over the basement side Conwy at home - John Gordon broke the deadlock on sixteen minutes and then with a minute to go until half time, Declan Poole made it two. Whenever we face The New Saints, whether it be home or away, we will always be "out of our depth" against the only professional side in the division and it continued to be true as the reigning champions secured a four one victory. Wes Fletcher, a brace from Sang and Lofts were on target for the Saints, Luke Boundford bagged a consolation for ourselves near the hour mark. And the final fixture of the match saw us face Llandudno at Belle Vue and secure a comfortable three nil success at home as Michael Pritchard's goal after just two minutes got us off to a flyer, Luke Boundford then doubled the lead on the quarter hour before right winger Watkin added goal three on sixty eight minutes. 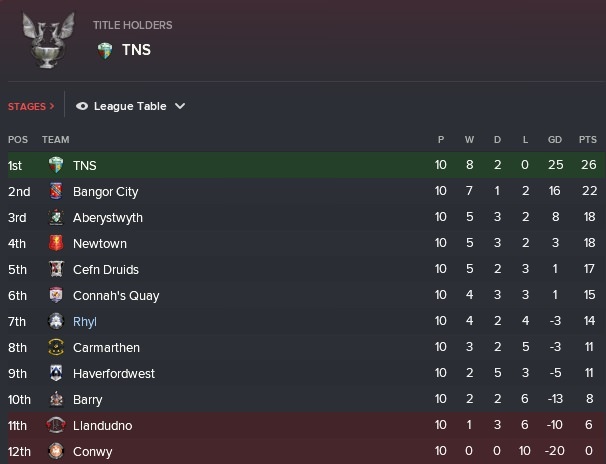 We remain in seventh place which I'm satisfied enough with currently but I'm still contemplating that this'll be my last season at Rhyl. Conwy are still bottom, winless and pointless after fifteen league games while The New Saints have opened a nine point lead at the summit. I feel it's time to move on come at least the end of the season @Dan but because my reputation is still poor, no proper clubs will want me so I may need to annoyingly stay put. It's been a promising season thus far at Belle Vue with Rhyl lying in seventh place after the opening fifteen games as we have now entered the final month of twenty nineteen and there's four Welsh Premier League games awaiting us with three of them being at home against Havefordwest, Newtown and Bangor while a trip to Connah's Quay will also take place throughout December. Two goals inside the opening half an hour saw us record a two goals to nil victory at Belle Vue against Havefordwest County as Luke Boundford and Michael Pritchard both scored. We then made the trip to Deeside Stadium to face Connah's Quay and produced a six goal thriller following a three all draw as the game finished three apiece. Michael Prichard got us off to a flyer with a goal after six minutes but a hat trick from Shackleton saw Connah's Quay take a three one lead at half time after Shackleton scored after eleven, seventeen and forty four minutes. Luke Boundford pulled a goal back three minutes into the second half but then both sides went down to ten men when Michael Pearson (63) and Evans (71) were dismissed, Boundford equalised with five minutes remaining to make it three all. It was back-to-back draws following a two two draw at home to Newtown. Reed gave the visitors the lead but goals from Michael Prichard (pen) and Luke Boundford had given us a half time lead but we couldn't hold on for maximum points as Reed's second goal of the game saw the points shared at Belle Vue. 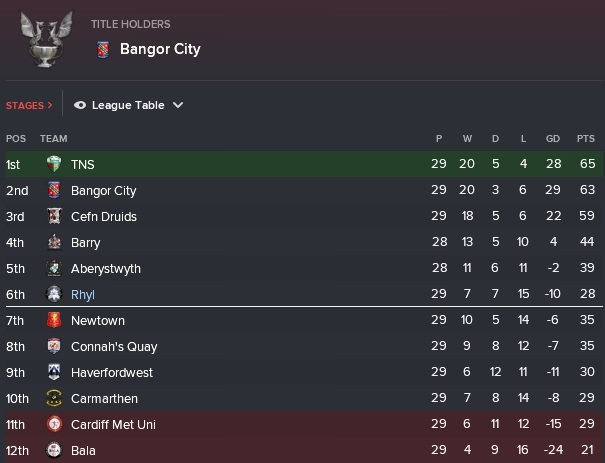 For the second season running a derby game against Bangor concluded the year and it would the Citizens fans who would be heading home happy following a two one success. We got off to a dream start when Luke Boundford scored after just eight minutes but the hosts couldn't hold onto the lead until half time because Adams levelled on forty one minutes and then Kieran Holsgrove won the game for Bangor four minutes into the second half. 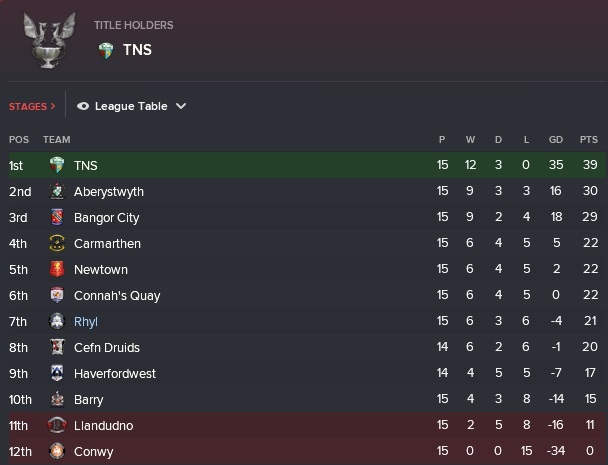 Due to not winning in the last three games we have slipped down to eighth position in the Welsh Premier League which is annoying but when you choose to play attacking, you need to prepare for conceding goals. Conwy are still bottom of the table but have finally got points on the board, TNS remain top and eleven points clear of Bangor. Throughout the month of December I was offered an interview at English side Concord Rangers, it was a "dead end" job so was immediately rejected. Steady stuff, but yeah Rhyl aren't good enough to get to the level. Oh I agree @DNZY but unfortunately due to my reputation only crap clubs will want me. It's a new year and it's been a decent campaign thus far for Rhyl Football Club who find themselves in eighth position but I'm still considering my future at the club due to the fact it's impossible to progress with them or any "poor" side for that matter - but onto the action and January brought three league matches - trips to rivals Bangor City and Barry Town United and a home encounter with Cefn Druids. 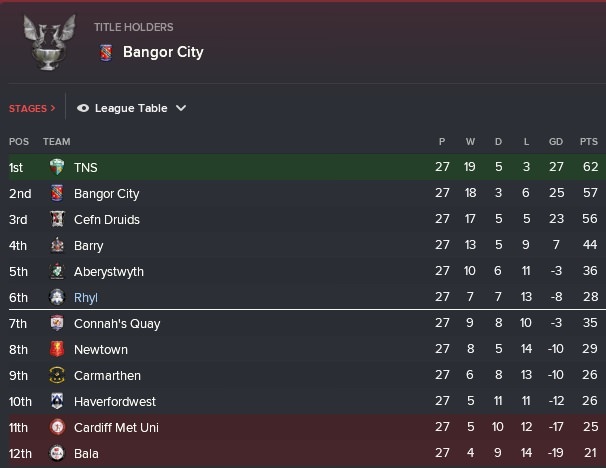 Just like the final game of twenty nineteen, the first game in twenty twenty saw us make the thirty seven trip to Bangor City and once again Bangor came out victorious, winning four two. Kieran Holsgrove and Doran both bagged braces for the hosts while Luke Boundford hit a double for ourselves. It was then thirteen days until our next game, a trip to Jenner Park to face Barry Town United and talk about a second half collapse on our travels and I need to take full responsibility for the collapse. Goals from Luke Boundford, Will Bell and Jordan Barrow had us three goals to nil up at half time but a second half hat trick from James and a Southam goal in the second minute of added time sealed the Barry fightback. Pure and utter frustration. Match day twenty two saw us welcome Cefn Druids to Belle Vue and a tenth minute goal from Luke Boundford turned out to be enough for a crucial and much needed three points against the Druids. 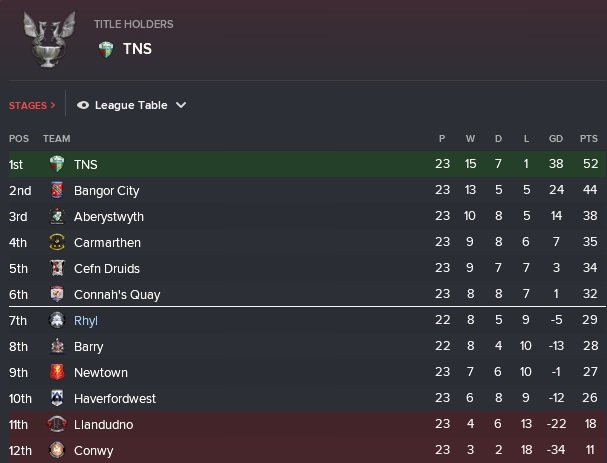 So with the split now confirmed it's going to be a bottom half finish for Rhyl which isn't the worst as I knew it was going to be difficult to secure another top half finish but I'm also confident we're strong enough to avoid being dragged into a relegation battle. Conwy remain bottom while TNS are twelve points clear and are taking a strangle hold on retaining the Welsh Premier League crown. Gotta start somewhere my man! Unlucky not to finish in the top half but if you're in 7th you could still fight for a Euro playoffs place. Again that's true @DNZY but the entire point of this career is I'm supposed to attempt to win every domestic trophy possible, thus far it hasn't exactly gone to plan. Unfortunately we couldn't secure a second top half finish in the Welsh Premier League and had to settle for seventh place but being eleven points clear of second bottom Llandudno I'd like to think we are safe enough for another season. There's five games in the Playoff Conference this month as we will play host to Barry and Havefordwest while we need to make trips to Newtown, Conwy and Barry. February kicked off with a trip to ninth placed Newtown and we returned from the near one hundred and sixty seven mile round trip with maximum points as Will Bell slotted home a penalty with just four minutes remaining at Latham Park. Just three days later and it was all about the comeback when Barry visited Belle Vue and took an eighth minute lead through Smith's goal but when the on-loan The New Saints defender Michael Wardley equalised just three minutes later we didn't look back and further goals from Luke Boundford and Declan Poole had us three one up at the interval - Tom Pugh added goal number four on fifty three minutes and that's how it finished. After the euphoria from beating Barry Town United last time out, it was a second consecutive home fixture but this one was a little disheartening as Havefordwest County produced an excellent three one success on their travels and made the near eight and a half hour round trip worthwhile. The visitors took the lead when Gray struck on twenty three minutes, Luke Boundford's goal on thirty six proved just to be a consolation goal because Healing put County back into the lead before half time and then Gray's second of the afternoon with nine minutes remaining sealed the three points for the away side. A dramatic ending saw us secure a hard fought two one win away to the basement club despite Declan Poole's eighth minute goal getting us off to a flyer at Y Morfa Stadium, Ellis equalised for Conwy nine minutes into the second half but the dramatic ending saw us be awarded a ninety fifth minute penalty in which Emir Weeks to make the short journey home a happy one for the travelling Rhyl support. But the month ended with a second half collapse at Jenner Park as Barry scored three goals to secure a comfortable and well deserved victory as it was a long and miserable journey home - goals from Wright (56), Huggins (77) and Smith (84) ensured maximum points for Barry. Despite picking up three victories throughout the month we have actually slipped down a position and are now in eighth which is a little annoying but it's due to goal difference and nothing else. Conwy remain bottom and look certain for an immediate return to the lower divisions while The New Saints remain top and seven points clear of second placed Bangor as once again it's looking like a two horse race for the title. Time to get out of Wales, this is going nowhere! Easier said than done @Dan especially when a) no one wants me and b) there's limited jobs out there with crap reputation but I'll be certainly looking in the summer to move on, ideally to a non dead end job. Three wins last month, confidence at the club was still solid enough despite slipping down one position to eighth in the Welsh Premier League Playoff Conference as those wins came against Newtown, Barry and Conwy. March brought just the two league fixtures this month as we welcomed Newtown to Belle Vue but before hand we made the half an hour or so journey to Llandudno. It was the trip to The Giant Hospitality Stadium that began the short month to face Llandudno and the second bottom side eased to a four one victory courtesy of doubles from Williams and Smolarczyk. Luke Boundford bagged a consolation goal in the third minute of second half stoppage time. We then had to wait a fortnight until our next fixture, the home tie against Newtown and the points ended up being shared in a one one draw at Belle Vue in which the away side struck first on fourteen minutes through Bakare's goal but four minutes into the second half Luke Boundford levelled the scores and neither side were unable to find a winner. A short but win-less month means we remain in eighth position and more than likely out of any chance we had qualifying for the European playoffs. Form needs to pick up though because we are only four points ahead of third bottom Newtown. Conwy, as expected have been relegated while The New Saints are only three points clear at the top with three games remaining. 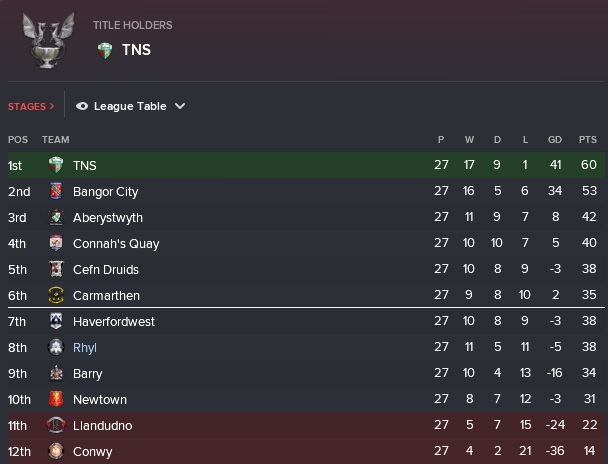 I won't be able to qualify for the European playoffs this season as I can't finish any higher than eighth place with just three league games remaining in the Welsh Premier League - the penultimate month saw us play two games which would see us make us the four hour plus journey to Havefordwest County before hosting already relegated Conwy Borough. The penultimate month began with the trip to Bridge Meadow to face Havefordwest and the hosts secured a five two victory which officially qualifies them for the European playoffs. Luke Boundford (15) and Emir Weeks (pen 63) scored our goals but braces from Stephen's, Gray and an Owen goal sealed maximum points for County. We then welcomed Conwy to Belle Vue, the game ended nil each. Boring stuff but the relegated Borough go home the happier side I'm sure. There's not much to say at this stage of the season from Rhyl's point of view. We are down to ninth and if it wasn't for goal difference then it could've been lower. Conwy are gone. Llandudno will be in the relegation/promotion playoff and now there's just the league to play for and it'll be a last day shoot-out between Bangor City and The New Saints.